This was my first Satipatthana sit at the constantly evolving and expanding European Long Course Centre of Dhamma Padana in Hereford. To my surprise I had a self contained unit, room with attached bathroom. The meals were to be provided breakfast at 6.30am and lunch 11am and that would be it for the rest of the day. One of the rules being as an ‘old student’ (some one who has sat at last one ten day course) one abstains from eating after 12 noon. However, its worth noting that whilst there were 50 students on this past retreat. There are plans to increase the capacity of the center to 100 with a purpose build pagoda complete with individual cells for each person to meditate in private. Big plans but for sure they are getting there with the help of volunteers and all through public donations. Anyhow, back to my sit, the Satipatthana course was only eight days long rather than ten, with the evening discourse focusing on the Maha Satipatthana Sutta. I guess the reason its shorter is that there are no new students and the assumption being old students would work harder. Obviously it is questionable whether this is true for me. So what came up as I sat on that meditation cushion, my instructions from Goenkaji were to observe rather react to the sensations in the body beginning with Anapana, awareness of the breath and its sensations below the nostrils above the upper lip. Then after day three move on to Vipassana complete bodily awareness and observation. The intention of this practice is to address the route cause of suffering through what Goenkaji (left) calls our cravings and aversions and this is perpetuated through our old habit patterns of the mind of wanting and not wanting. 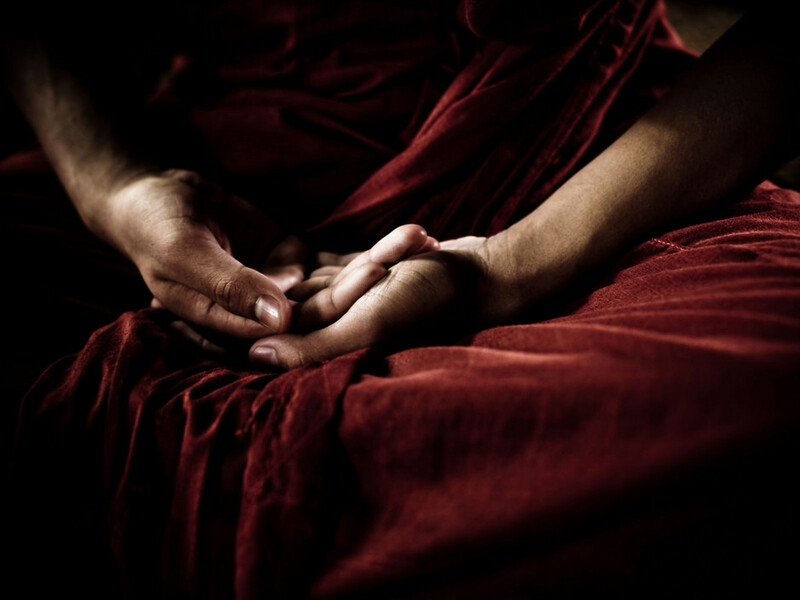 By sitting and observing the body, one is in theory able to dismantle these patterns. So what happened? At the start of every sit focus breath, sensations,.. within seconds my mind is off wondering through the draws of uncompleted tasks and projects I have left behind in London. Its either that or my body decides to completely shut down as it assumes as there is nothing to be thinking about apart from observing the body then it might as well fall asleep. Nodding off is incredibly easy for me to do in meditation, a bit like doing savasana (corpse pose) in hatha yoga, but unlike yoga you are supposed to be sitting upright and I was constantly jolting myself awake from the fear of head butting the floor. You would assume that sitting and doing nothing but sitting, upright with the straight back would be relatively straight forward. Well the number of physical discomforts in my body during previous courses are numerous and this most recent was no different. It was this that most nerved me ‘OK so what pain am I doing to go through this time?’ As predicted it happened. First it was my shoulders, then ankles and then hips and of course the rounded slumped back and the crocked neck. Having to observe and not react to these physical discomforts was really challenging. 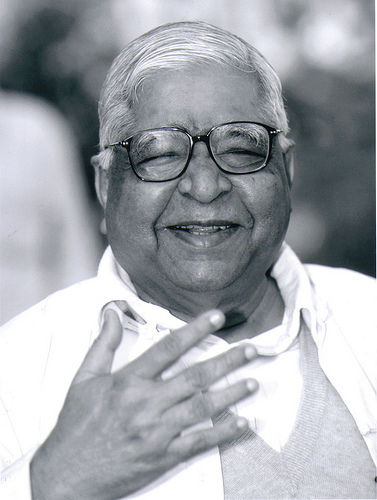 Goenkaji guided me with his vibrational tones of being equanimous and that all things are changing and it will all pass. There are several time that I don’t quiet believe him. By day five or six the physical discomforts of sitting and the perpetual nodding off are subsiding however, the my mind is having a fantastic time roaming from one thought to the next. I was surprised at the number of mundane things that can come up like cleaning the inside of my car to sorting out my sock drawer to recycling my old clothes,.. the power of the frittering mind is phenomenal. All in the avoidance of observing the sensations of the body. Some of us actually got completely stuck with the traffic,.. on the day the London hit a Saturday late morning afternoon snow storm,.. OK that may be a bit 0f too much personal information about where I was at,… but life goes on and I am not the center of the universe. The Yoga Flash mob happened,… click here to see! Yoga For Unity is working on an awareness campaign for a charity group called The Africa Yoga Project to support Kenyan yoga teachers who, using yoga are tackling Tribalism in their country. Already this has seen many youths, who were idle and living in the slums, to receive a personal transformation through the practice of yoga. It is this experience that the yoga teachers would like to take out to the the rural districts in Ke…nya Rift Valley, to bring transformation on community levels. OK this is not quiet hanging out hey but it looks pretty cool! Price: £50 on the day or £40 concessions or if booked before 4th April 2011. This workshop forms the second part to our offering at the Brighton Natural Health Centre. Tap into your acrobatic potential. Believe in the possible. Learn to flip, spin, drop back and float, all while suspended in the air with the support of a partner! Using time-tested acrobatic training techniques, students will learn how to combine basic flying positions with inversions to create dynamic flying flows. We will demonstrate techniques for bases, flyers and spotters that will keep the flying safe and supported. Come with a familiarity with handstands and 3-6 months a AcroYoga experience. Now there is a now way to 'hang out'! Where: Brighton Natural Health Centre, Brighton UK. This workshop is part of a two part series at the Brighton Natural Health Centre for 2011 the first focusing on therapeutics. Come along and indulge yourself! 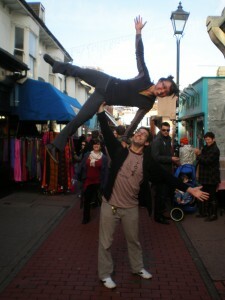 Therapeutic flying and Thai massage are the practices that hone an AcroYogis ability to be sensitive and receptive. Students will learn and practice honest, clear, compassionate communication to build the foundation of partnership. We will draw upon the natural forces of gravity and “metta” loving kindness to encourage the body to let go of fear and tension. 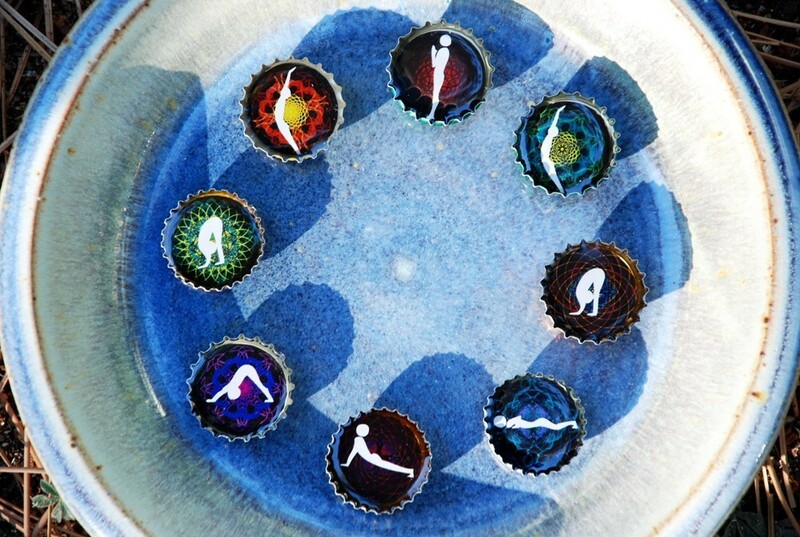 The flow of basing and flying, giving and receiving, honoring and accepting, inhaling and exhaling will take both yogis into a new place of union and bliss. Some yoga experience recommended, no partner needed. **All accepted participants will be required to attend the whole weekend. Exploring the principles of acrobatics, we will focus on alignment and strength as the building blocks to embodying inversions and acrobatic balancing. We will create a safe container based on the art and skills of great spotting that will serve to support our play mates throughout the weekend. Using these foundations and a smattering of games and group exercises we will progress from basic to more complex partner acrobatics; cultivating trust and clear communication, whilst homing in on the roles of basing and flying. Building on the foundations of previous day, we will begin to work on simple to complex flying transitions and washing machines. Working mainly in acrobatic trios, with clearly defined roles of being a base or flyer; the day will focus on the ability to work with compassion, honesty and mutual support to achieve the groups’ success through a variety of acrobatic skills and tricks. You will be faced with challenges and fears but will learn how to deal with them head on through your inner strength, group support and a knowledge that safety is everyones’ priority. 1. Have experience basing and flying acrobatic flying transitions. 2. Can you do a one minute handstand against the wall. 3. Can you do a one minute headstand in the middle of the room without a spot. 4. Can you base or fly star and shoulder stand on hands. 5. 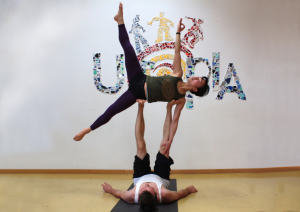 Have you studied the AcroYoga Flight Manual.